Take this short quiz to better understand your hearing needs and to create your pathway to hearing better. I sometimes have trouble hearing while on the phone. Can we connect you with a local hearing care professional? *** This quiz is intended to give general recommendations based on your answers to the questions. 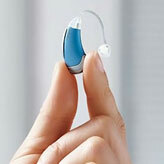 It is not a replacement for a medical assessment by a professional hearing healthcare provider.